The truth. The truth is I’m, despite my best efforts to slow down & recapture a lost way of doing thing, wildly, inextricably modern in so many ways. I drive my car to run banal errands daily. I answer emails (in theory). I’m addicted to my ipad. And I resent the way the seasons give and take. Most especially tomatoes. I have a difficult time accepting the fact that I can only have them fresh in the summer. They come. They go. And it seems to happen in a flurry, and I hate it. I never get enough. I grew up with the false belief, as most children of the 80’s, that I could in fact have it all whenever I wanted it. Asparagus in February, strawberries in November, tomatoes in…never. I hated them growing up. Because even though I didn’t know the first thing about eating seasonally, I knew those watery, mealy facsimiles that the whole of creation seemed intent on slapping on sandwiches and slicing on pitiful salads were not good. The thing is, I had no idea there was anything else. I would oft reminisce about how strange it was that, as a child, I’d eat tomatoes at my grandmothers like apples with salt sprinkled on them. I figured I’d just grown out of my taste for tomatoes. I think I was nineteen before I discovered them again. Real tomatoes. 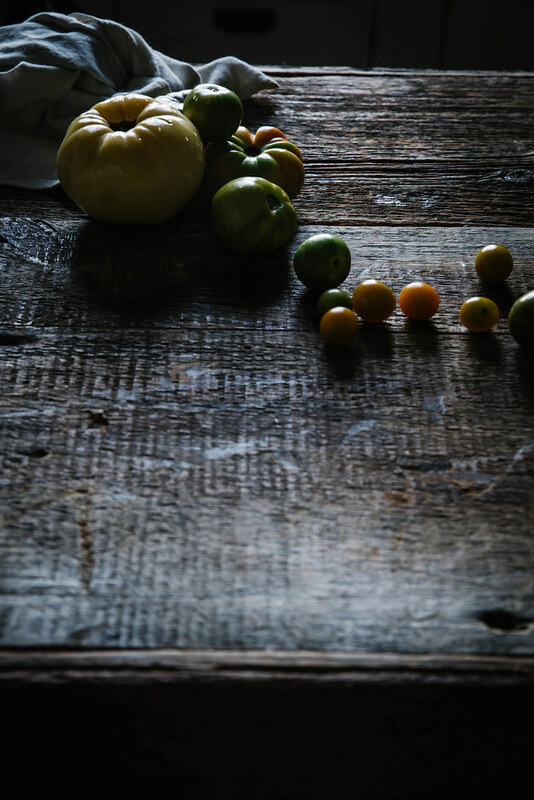 Summer heirlooms. The kind a southern grandmother might happen to grow in her backyard. When I did, I became a vegetarian for two whole years simply because I was all at once impressed with the vegetable kingdom. Okay, so I was a lousy New Orleans vegetarian that slurped oysters and sucked the heads of crawdads and therefore not a vegetarian at all. But still, other than those two surreptitious vices, I was strict. In the end, I think I just wanted to say, sounding slightly bored & with an air of superiority, “I’m a vegetarian.” Which is not just a little hilarious given my taste for gin, cigarettes, and narcotics back then. But regardless of the fact that it was an unstable identity that motivated me, I explored vegetables in those years in a way I never had. And for that I’m grateful. A few things… Ireland! I’m teaming up with Imen of Farmette and acclaimed food stylist Susan Spungen for Lens & Larder, a food styling + photography retreat in at the Ballynahinch Castle in Connemara. Get more information and register here! Steller. I’m obsessed with it. You will be too. For years now, I’ve obediently eaten with the seasons. And while I’m not a vegetarian, I choose my food based on how it was raised & grown. We eat good meat, but when we don’t have company, we largely eat vegetarian. With the odd slice of local belly bacon or country ham thrown in from time to time, naturally. But despite loving & being used to eating this way, that doesn’t mean that I don’t, each year, mourn the passing of my favorites. This rhythm is the ancient rhythm. The one that birthed the idea of maiden, mother, and crone. In the image of the triple goddess forever flowering, blooming, and wilting, I find so much inspiration. Contained within the idea that everything passes is the idea of eternal return, and so I celebrate the waning of summer. In its end is also the promise of its return. 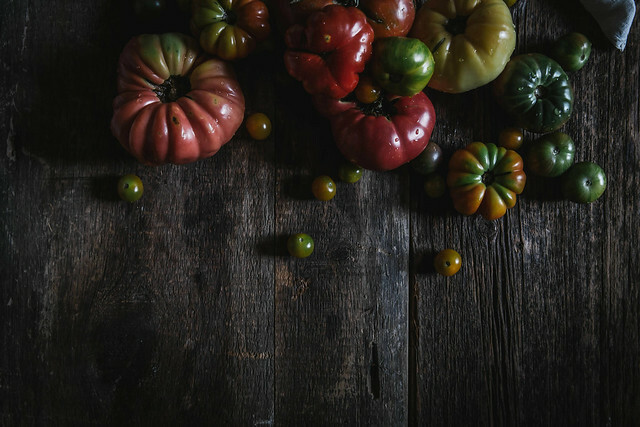 I’ve met few fruits that didn’t take kindly to a great pie crust, and these tomatoes are no different. When you have produce as gorgeous as these, you don’t need to do much to them. 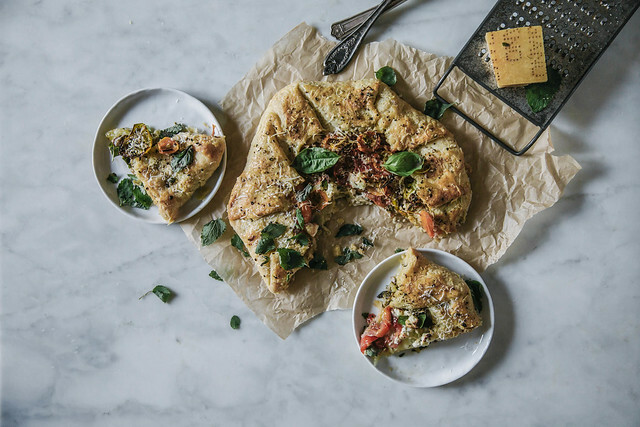 Crust, pesto, a good local cheese, and a few thin slices of shallot are plenty. There’s no need to over-complicate anything. And that’s why I was willing to brave the suffocatingly crowded Sunday market for these jeweles. They’re that good. Simple food is the natural conclusion of fresh, seasonal produce. And that’s what our southern suppers look like. On a Wednesday of no particular import, this is what finds its way to our plates. So, from my southern table to yours…I hope you get the chance to make this flavorful tomato pie before the season recedes. The lemon balm & almond pesto really ads something else, and the finished dish is far more than a sum of its parts. Make your crust. In a mixing bowl combine the flour and salt. Cut the butter into the flour with your fingers or a pastry cutter (I much prefer my hands) until no pieces larger than a pea remain. With a wooden spoon stir in the water until the dough comes together. Form into a ball, flatten into a disc, and wrap tightly in plastic wrap. Chill for at least an hour before rolling out. It will keep up to 24 hours like this. While the dough chills, make your pesto. 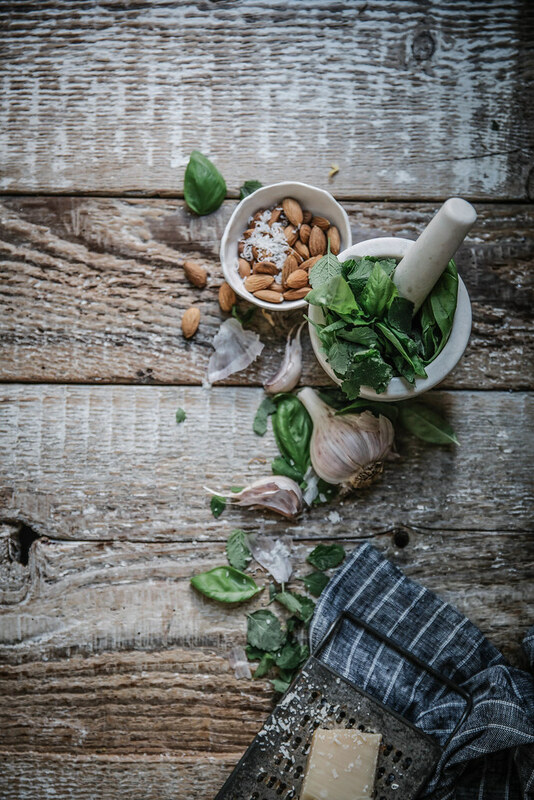 Combine the lemon balm, basil, almonds, garlic, and a pinch of salt in the bowl of a small food processor and pulse to combine. It should be well chopped but not completely smooth; you want a bit of texture for your tart. Add in the 1/4 cup parmesan and vinegar and pulse. Then slowly add in the oil and pulse to combine. Alternately you can make it in a mortar & pestle. Grind the garlic with a pinch of salt to form a paste, add in the lemon balm & basil and pound & grind until the leaves are broken down. Add the nuts and grind until combined. Then add in the 1/4 cup parmesan, the vinegar, and half the oil. Grind to combine, then add in the other half of the oil and continue to mix with the pestle until homogenous but still a little chunky. The former, naturally, takes a lot less time than the latter, but I personally prefer the experience & chunkier texture of mortar & pestle pesto despite the extra effort. Now it's time to roll out your pastry. Place the disc on a well floured surface, flour your rolling pin, and roll the pastry into a rough circle about 1/8-1/4" thick, flouring your pin as needed and rotating the dough clockwise every few rolls to prevent sticking. Transfer rolled out crust to a parchment lined rimless sheet pan and stick in the fridge for 10 minutes to chill. 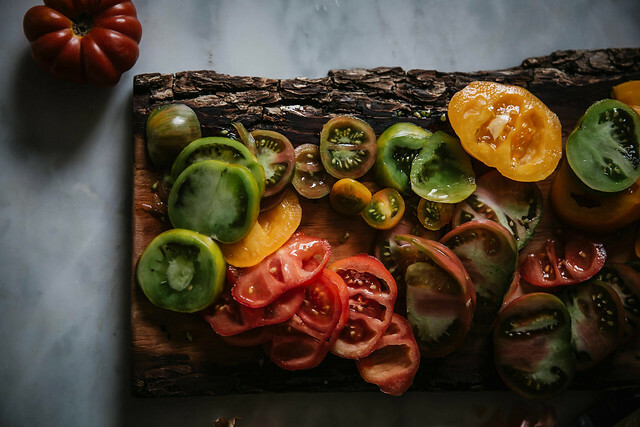 Now is a good time to slice your tomatoes. After slicing them, lay them on a paper towel lined plate, sprinkle lightly with kosher salt, and allow to drain while your crust finishes chilling. Remove the pastry from the fridge, and spread the pesto over it, leaving a 1 1/2" rim. Place a layer of tomatoes over it, sprinkle with half the shallot and goat cheese, top with a second layer of tomatoes and sprinkle with the remaining shallot and goat cheese. Fold the edges up to seal the galette. If it's too cold, the pastry will break when you try to fold it. If it seems to be too cold, just wait a sec. Brush the crust lightly with the egg, and then sprinkle with sea salt and pepper. Sprinkle the entire tart with the remaining 2 tablespoons of parmesan. Bake 25-35 minutes or until the galette is golden brown. Let cool for about 15 minutes, sprinkle with a few fresh leaves of lemon balm & basil, slice, and enjoy! Along with a bright green salad this makes an excellent locavore, vegetarian supper. And it's great warm or at room temp, so it's perfect to make ahead for a get together. 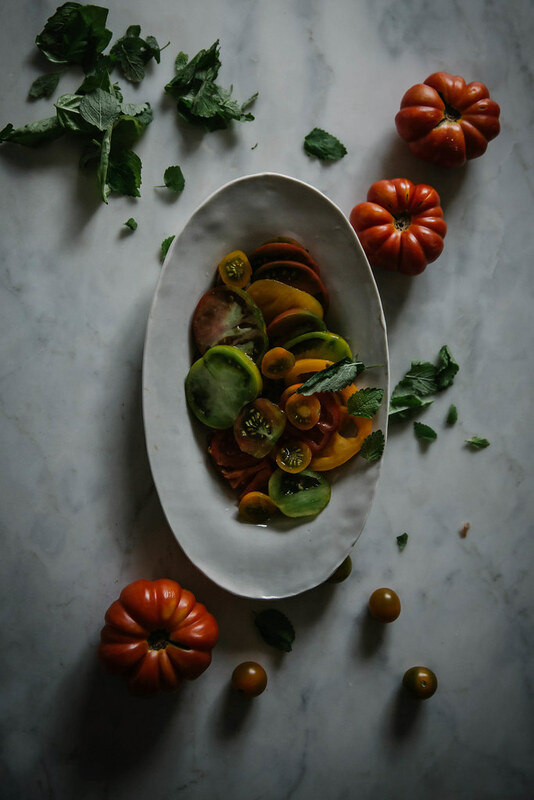 Summer's fleeting already, and it's hard to believe, but this recipe is a great way to make use of the tomatoes I'm sure you're hoarding (like I am). I can hardly bring myself to cook them, but this galette does them justice. It's like a southern pizza. Beth you are so right about the richness of the summer veggies! I try to follow the vegetables for the season but to tell you the truth winter does nothing for me. I think of white — yucky snow, turnips, potatoes, rutabagas, etc. Does it do anything for you? I am on a quest to find halloumi — ever since I saw it on a blog I have been craving it and I haven’t even tasted it. Have you ever tasted it? It’s big in the UK but I don’t know if we can find it here. I wish I could be at the conference — your photos simply amaze me. I’ve never tried lemon balm pesto, but I have a bush that did extremely well this summer, and I think this is how I’ll use it up! I love the combination of flavours in this galette! Looks lovely! Like you, I grew up eating tomatoes (with salt sprinkled on them) like apples. I remember how I just couldn’t get enough of them. 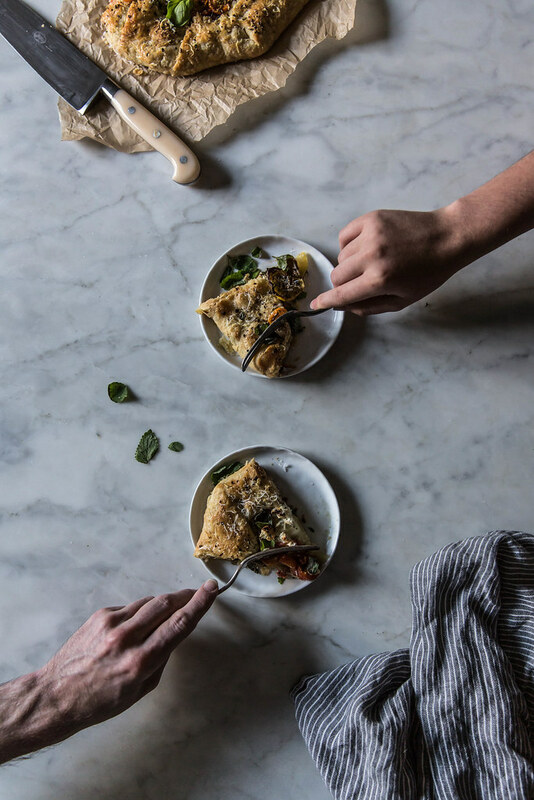 This galette looks like a perfect dish for a lazy summer day. ..And your photography is superb. It’s winter here now (I live in Brazil), and I’ve been longing for tomatoes and stone fruits, especially cherries. I’ll save this fantastic recipe for when the days are warmer here. 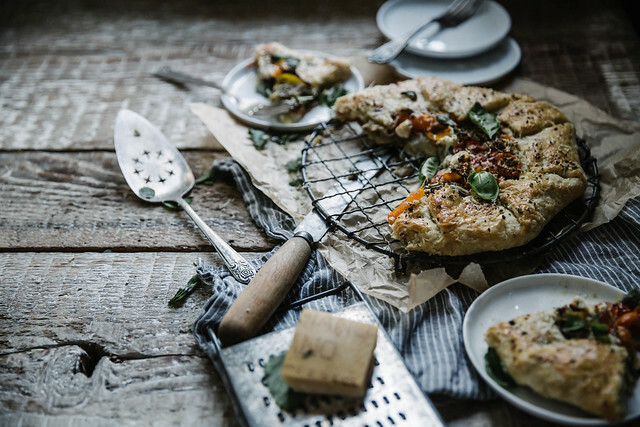 stunning.. never would have thought to make a savoury galette before. I eat tomatoes all summer sprinkled with sea salt (ok, doused!) and rarely eat them the rest of the year. 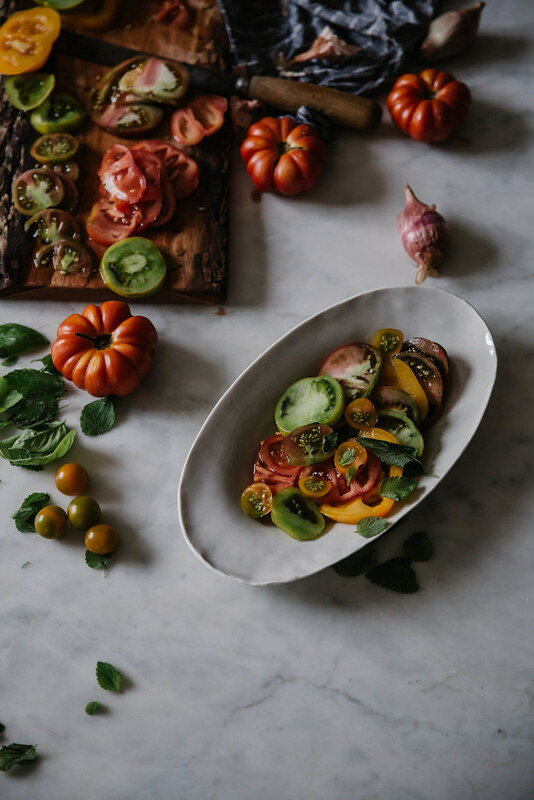 There is nothing, absolutely nothing like a summer tomato. I’m also madly in love with your towels, where did you buy them, if I may inquire? Your blog, your instagram, your recipes and your pictures are just lovely. Simply perfect. Everything about this is just perfect and of course gorgeous photos! 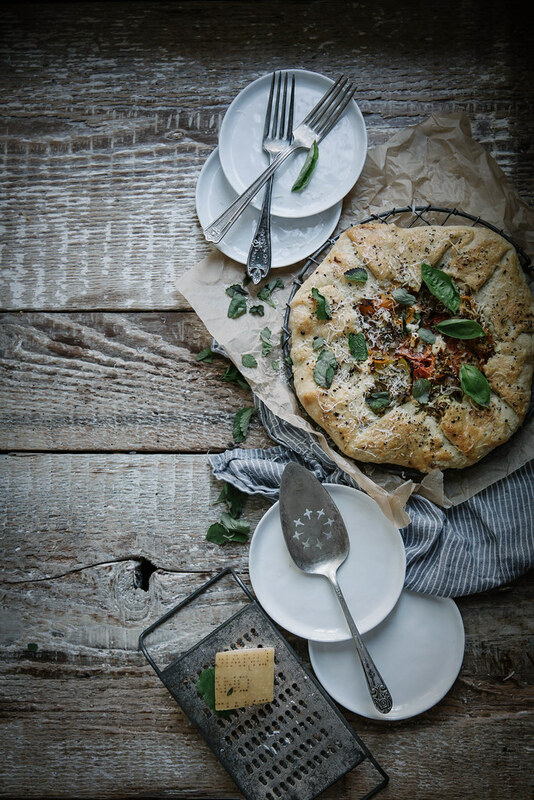 Beautiful photos and the food looks beautiful. Can’t wait to get to the market and straigth to the kitchen to make this! You make me yearn for summer, those tomatoes look so delicious, I am already imagining the sweet, sour juice with salt. Yum. Love this! My bf hates raw tomatoes but eats them cooked, so I’d love to try this out on him! Gorgeous pics. 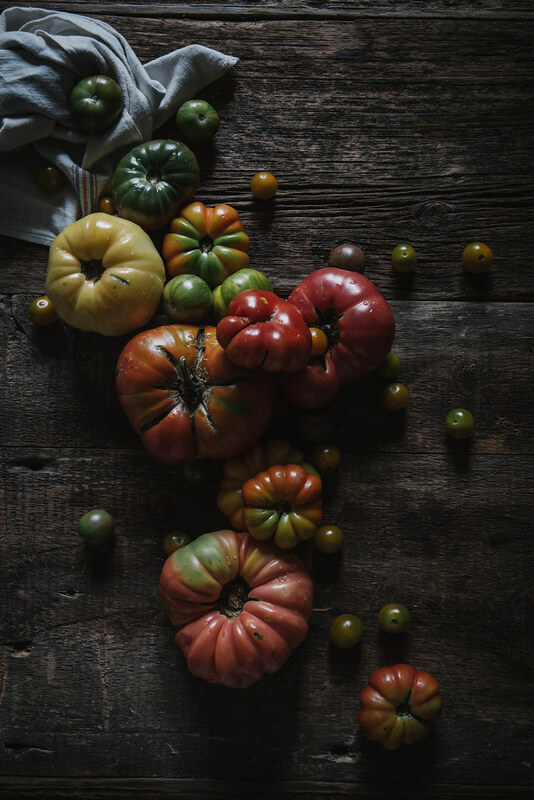 Moody tomatoes! Hi there, firstly, your writing is so, so beautiful. And, secondly living in the UK where a dark, cold and rainy fall/winter awaits:(, I can totally relate to your sadness at seeing summer and its bounty disappear. But these seasonal changes force us to connect more to Mother Earth and to become more creative, don’t you think? (I just started pickling (first time ever) and am rather excited ;)). The pictures are beyond beautiful, as always and the recipe, amazing. You’re site is utterly lovely, thank you so much for the continuing inspiration. Very beautiful website and the imaging is very serene and has an effect of luxury and rustic. 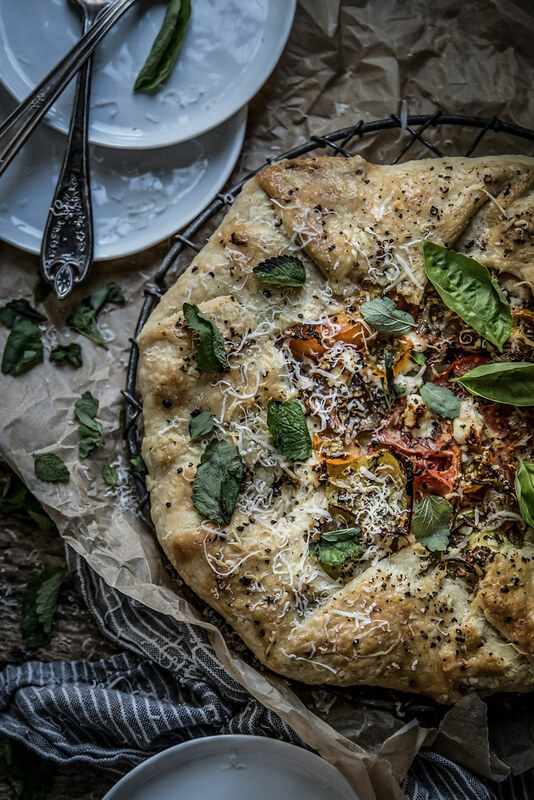 I am going to try this recipe also and I love the tomatoes with basil base for the pizza. Thanks. My lord! That looks delicious! First off, your photography is truly amazing. I follow you on Pinterest and your images always stand out to me – I love your style. I tried to grow tomatoes for the first time this year and was so excited to see them grow. My excitement vanished when my plant tipped over during a windy night and snapped the stem. This recipe looks so delicious! I’ll have to go to the farmers market here in Minnesota so I can make this! About twenty years ago I bicycled through the Connemrra (and several other places in Ireland). It was stunningly beautiful. I can’t wait to see the photos from your workshop. The food in Ireland was wonderful as well – despite reports to the contrary in the travel guides of the time. I adored the scones, and we had wonderful potatoes and salmon and lots more vegetables than were generally served here in the U.S.. Really fine music as well. Your photos slay me. So gorgeous, every time. I love a savory galette. I often make an apple and local brie galette in the fall, but this looks like the perfect summer one. Thank you for this beautiful post. I love the way the cheese on the tart is curled and scattered as if it were to tumble out of my screen. Fresh summer tomatoes really are the best! By the way, what on earth is lemon balm? did you encounter much juicy leaking? These photos are so stunning. I especially love the final shot! What a gorgeous tart. Your story about tomatoes reminded me of how we brought some of our colorful homegrown heirloom cherry tomatoes to my sister’s and her son, then 3 y, who normally does not eat any vegetables, devoured them. Too bad tomatoes are so difficult to grow here in the wet Netherlands and the season so short… I still have some though and plenty of basil from the garden and would love to try your galette. I adore lemon balm but never quite know what to do with it. I usually just chop it up in sautéed onions (with some balsamic vinegar) as a side dish. This summer I planted a couple of containers and this will be a wonderful treat. Thanks!! This galette looks so positively beautiful! I think i’ll make it for dinner tonight. I get sad towards the end of summer too because I know all to soon my world will be covered with snow. So. not. fair. 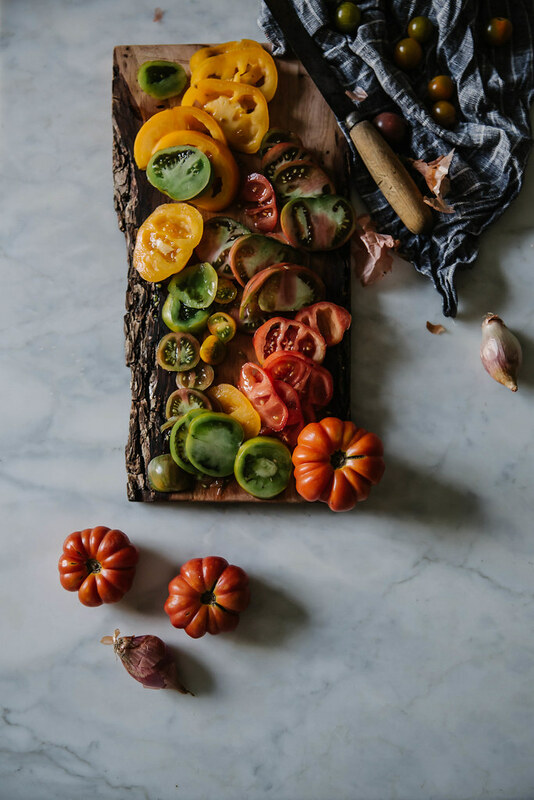 This galette is just perfect as are those heirloom tomatoes. You’ve done a beautiful job as always. Also, your workshop in Ireland sounds fantastic! Congrats, lady!! What an absolutely lovely blog you have. So beautifully shot and written. I’ll definitely be sharing this gold find with my friends. I’ve been wanting to make something other than caprese salads with my tomatoes. thanks for the idea! This post is just gorgeous. 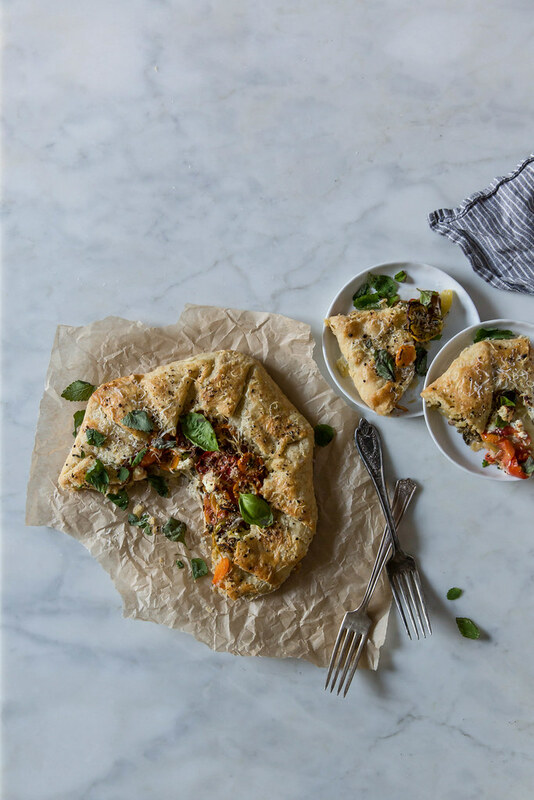 Savory galettes are my weakness. Thanks for sharing. i can really relate – although i’m not a vegetarian, i used to be one for 6 years. after that, i decided i could control what meat i do eat, and i still have very vegetarian habits. I absolutely loved everything about this blog. I could not agree with you more on every level. I love tomatoes and miss them dearly as the season ends. I just cant buy them post season knowing they have been shipped from somewhere they aren’t even supposed to grow and on top of it they have no taste. You have inspired me to go to my market, get a boatload of tomatoes and make something simple and delicious. This is one of my most favourite combintions not to mention your impeccible styling. I’ve made a few galettes with our heirlooms this summer and this has been my favorite. The pesto and the goat cheese really make it. Please sign me up for your website. Thank you. At the end of the season last year I was gifted with some heirloom tomatoes from a friend’s garden (mine haven’t done well the past couple years). I had been looking for uses for the beautiful lemon balm that grows in one of my herb rows. So I tried this. Wow. What a wonderful irresistable combination of flavors. As I nurture this spring’s tomato seedlings and get ready to set them out in the garden (nope – we haven’t done that quite yet in our corner of Maine) I am remembering this recipe and dreaming of August. I grew up thinking that you could have tomatoes all year round as well. But once you’ve had farm-fresh produce, it’s really hard to go back to the watery, flavorless alternatives you see in grocery stores out of season. I just made this for dinner and it turned out amazingly well. It looked a little labor intensive, but it actually came along very smoothly and was kind of cathartic. Thanks for the wonderful summer recipe!